John Rose. Thursday, December 24th, 2009. The first two Greenstone collections to publicly implement OAI-PMH (Open Archives Initiative - Protocol for Metadata Handling) are now fully operational for data harvesting. * Memoria Académica of the Faculty of Humanities and Educational Sciences, National University of La Plata in Argentina - the OAI base url is http://www.memoria.fahce.unlp.edu.ar/oaiserver.cgi. Both of these collections are registered in ROAR, OpenDoar and the Open Archives list of Data Providers. By activating the integrated OAI-PMH Greenstone server, a Greenstone collection can participate in the worldwide open access network by which bibliographic data is made freely available by more than a thousand OAI-PMH data providers (often called open access repositories or institutional archives). Several other Greenstone collections are referenced the above registries (7 in ROAR, 19 in OpenDoar which does not require OAI-PMH access for listing) but these collections have either not implemented OAI-PMH, or not correctly parameterised their server, or not correctly registered their service. Interested users may consult the OAI support page on the Greenstone wiki. In addition to providing an OAI-PMH server, Greenstone has integrated OAI-PMH harvester (in the Download tab in GLI) which permits the acquisition of data from OAI-PMH servers to enrich Greenstone collections; in addition to the access to bibliographic data as defined in the OAI-PMH protocol, this harvesting facility also enables downloading of the associated documents if they are referenced in the OAI-PMH records. Users’ comments are invited on OAI in Greenstone, e.g. on technical issues or facility of use, on other existing operational collections unknown to us, or on plans for new OAI-PMH Greenstone services. Dave Nichols. Thursday, December 17th, 2009. 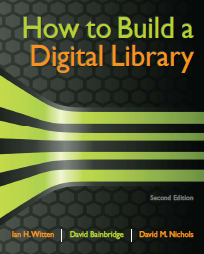 We are pleased to announce the publication of the Second Edition of How to Build a Digital Library. The Second Edition is a major rewrite, including new material on multimedia, metadata, internationalisation and the roles that people take in digital libraries. The book is divided into two sections: Part I on Principles and Practices and Part II on the Greenstone Digital Library Software. This division allows the book to be used for general digital library courses (using any software) and frees Part II to provide the most detailed description available of the Greenstone software suite. The book website has lots of supporting material including: samples of the Preface and Chapter 1, an online Appendix on markup and XML, and all of the Figures and Tables. Witten, I.H., Bainbridge, D. & Nichols, D.M. (2010) How to Build a Digital Library, Second Edition. Burlington, MA: Morgan Kaufmann. More details at Amazon.com and WorldCat.